You ever met someone and it feels like you have been knowing them for years? That's how it was talking with Eva LaRue. It doesn't seem fair to call it an interview. Aside from our mutual love for All My Children, we also have kids who will be headed off to college soon. Eva and I talked All My Children, kids, travel, CSI: Miami and her new show on the CW Network Chicken Soup for the Soul's Animal Tales. Eva is from a small horse town in California, Norco. Norco's theory is if it ain't broke don't fix it. They have kept their Old Pony Express Stop the same for years. They still have a huge rodeo every year. And they still have horse trails for sidewalks. Love it. Eva's first love wasn't acting. It was dancing. She started ballerina classes at the age of four. Growing up she dabbled in theater, singing and acting (booked her first commercial at 6). But the little ballerina's heart belonged to her tutu, ballerina slippers and toe shoes. But then came high school where she was cast in the Dinner Theater version of West Side Story. Things changed. Her role in West Side Story gave Eva the chance to combine her singing, acting and dancing talents. Eva had a new love, acting. And it was full steam ahead. Eva's big break was our All My Children. Now that's a big break! Eva describes the experience as an "amazing training ground". As we know actors who work on soaps work hard. Eva's experience was no different. It was awesome yet intense for Eva with "a mind numbing amount of work to do." For the next four years, Eva gifted us with the beautiful and smart Dr. Maria Santos (Grey), also one half of the supercouple Edmund and Maria. Eva left All My Children in 1997 for the best reason of all; she had her daughter, Kaya, (such a beautiful name). Eva described that first year being away from All My Children as a "weird transition year emotionally, physically and psychologically." Eva had been working in the non-stop world of soaps and didn't realize how she had been going non-stop until she actually stopped. So it's not a surprise that a few years later when Eva was set to return to All My Children, she paused; all us working moms can absolutely relate. She knew what it would take to go back. Thankfully, Eva paused but returned. Whatever it took to go back, Eva gave it and then some. Eva and Dr. Maria were as fabulous as ever. Eva and Dr. Maria moved away from Pine Valley permanently in 2005 but did make a few guest appearances thereafter. Eva also appeared in one of the final episodes, of the television version, in September 2011. Eva went from Pine Valley to Miami; CSI: Miami. For eight years Eva played Detective Natalia Boa Vista. She hit the jackpot again and landed at another great spot. "It was a really amazing experience and another great family of people. It was easier in a way than All My Children. But at the same time because there was so much science dialogue that it wasn't that easy either. It was like speaking another language. It had its own difficulties." In 2013, All My Children and CSI: Miami both went off the air. "It was a sad end to everything." But as they say, every cloud has a silver lining. Eva knew exactly what she wanted to do with all her free time. "I had been working since my daughter, Kaya, was a baby. For the first time, I had the opportunity to stay home with her. I'd always wanted to travel. The soap schedule is year round. There is no hiatus. You get a maximum of four weeks a year. But you can't take them all together. You have to take them here and there. I suddenly had all this time. I'd always wanted to see the world. I felt like I missed so much time with my daughter when she was growing up. I just wanted it to be her and I. We embarked on a trip around the world." Indeed they did. Hopefully, you are better than me and can rise above jealousy lol. But I couldn't help but be a little envious as I listened to some of the places Eva and Kaya have been; Thailand, Turkey, Africa, Panama, Italy and Croatia. Not jealous yet? Well, their bucket list includes going to see the gorillas in Rwanda and to visit Bali. Amazing. You like me can turn all kinds of green with envy by checking out more of Eva and Kaya's travel photos; follow Eva on Instagram @ImEvaLaRue and Kaya @topteentraveler. Eva and Kaya embarked on another adventure together, their own YouTube Series; titled ParentTeen. It's a very ambitious endeavor to do a series about teens with your teen. We wanted Eva to tell us all about it. "It's been really fun. My daughter didn't want to do it at all. You would think she would be the one who would want to do a YouTube Channel but not at all. I said Kaya 'let's just do this thing. If we make it funny and informative about things that you and I are dealing with, I think this could be really fun and funny.' We have done seven episodes. We are going to pick it up in the New Year. Kaya is also thinking about doing her own podcast." We watched ParentTeen. It's really cool. **Check it out yourself. Look up the Eva LaRue Channel first on YouTube then search ParentTeen. ** Watch the trailer below. 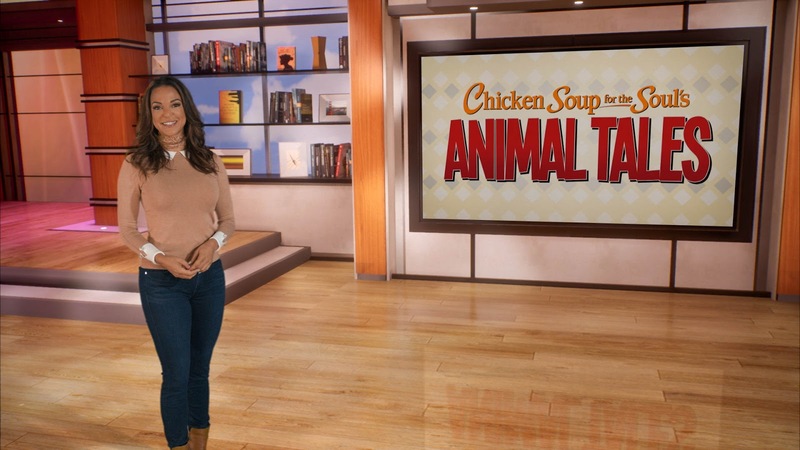 Next, we discussed Eva's new show, Chicken Soup for the Soul's Animal Tales. The show premiered on Saturday, January 5, 2019, as a part of the CW's Saturday morning line-up. Please allow Eva to give some background because we can't ever get enough of stories where fate comes a calling. Listen. "I don't normally watch Saturday morning television. But about two months ago, I had the TV on. I came across the Magnificent Mornings stretch of TV on the CW. I saw Chicken Soup for the Soul's; Everyday Heros hosted by Brooke Burke Charvet. It was so awesome, inspirational and educational. It was people doing amazing things. I was hooked. I thought. This is really good TV. Why isn't there more of this on during the week? Where have they been hiding these shows?" Two months later, Eva gets a call from her agent that Chicken for the Soul is doing a spin-off of Everyday Heros just for animals because the animal shows were the highest rated of the series. And yes they wanted Eva to host it. Smart people. Eva was so on board for several reasons. "It's great TV. It's the kind of thing that Kaya and I can watch together. It inspires both of us. And you can't beat the schedule. We shot 18 episodes, a full season, in three days which frees me up to do other things. We love animals. I grew up with horses, goats, dogs, cats. It's exciting and I just love being a part of it. I was thrilled to do it." We asked Eva what were some of the highlights some things that stood out in the first season. This story will blow you away. Listen. "We feature a dog that has saved a boy, with a severe condition, who is too young to communicate to his parents when he is feeling like his blood sugar is too low or too high. The dog has been trained to stay by the kid's side and to smell when the boy's blood sugar is too low or too high. When the young boy's sugar is too low (he needs something immediately i.e. a shot) the dog runs over to the mom and lies down. And when the dog runs over to the mom and barks that means the blood sugar is too high and it needs to be regulated." Isn't that incredible?! Eva told us the entire first season is full of stories like these. It's full of "incredible people doing amazing things for animals and incredible animals doing amazing things for people." Eva sees the show as something even more. "It connects us in a deeper way in a bigger way to other people, stories, solutions, miracles and things that we don't know exist. But when we know they exist it makes us all better. Just knowing that it exists in the world makes things better." One of my favorite parts of the "interview" is when Eva and I went off topic and talked about any mom's favorite topic, their kids. As we mentioned earlier, our kids are leaving for college soon. We have been having similar conversations with them about their future. We've discussed it's okay if you don't have it all figured out right now. All you have to do right now is to start. Eva shared a few life lesson nuggets that I have already shared with my sons. "Focus on stringing one pearl at a time and eventually it will be a necklace. You can't see the necklace now but just string one pearl at a time and in the future, it will all make sense. You can only tell the story backwards. You can't tell it forwards." Love love love love it. Eva has only continued to ascend since her big break as Dr. Maria Santos (Grey) and of course, we couldn't be happier for her. But Dr. Maria will always be near and dear to our hearts. CSI: Miami was the most watched show in the world. But here in the USA guess what Eva is most known for? Yep, more people know, recognize and approach Eva as Dr. Maria Santos. Eva says, "Dr. Maria is always first then comes oh yeah, CSI." Of course, soaps rule. Make sure and check out Eva's Instagram @ImEvaLaRue and Kaya @topteentraveler for those amazing travel photos, her ParentTeen Series on the Eva LaRue YouTube and watch Chicken Soup for the Soul's Animal Tales on the CW on Saturday mornings. Eva's message to her fans; "Thank you for having the same enduring love for All My Children that I have." We do and we have the same enduring love for you as well, Eva!